Consumer advocacy researchers at CHOICE have launched a service which they claim will help to ensure that customers never pay more than they have to for electricity. The program, called CHOICE Transformer, costs about $100 per year but saves their customers $505 on average – possibly much more. 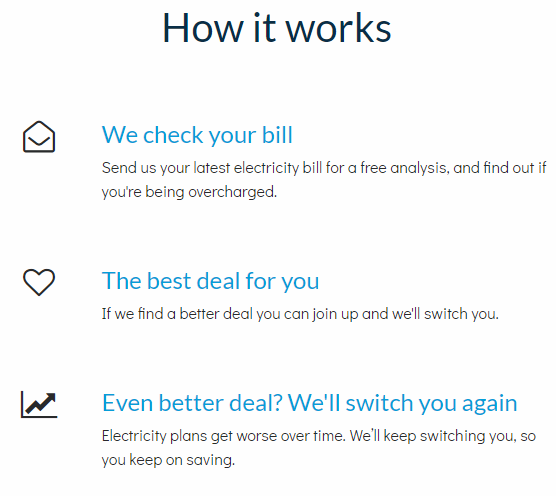 Once a customer is signed up, CHOICE constantly scans the entirety of each deregulated electricity market (33 retailers nationwide) on their behalf, automatically switching them to the best deal available. CHOICE makes their money on the customer subscription fee, with no kickbacks from electricity companies. The program is an interesting one, especially in a country where deep-seated mistrust of electricity retailers – especially among solar system owners – means that customers have little sense of loyalty to the company selling them electricity. In a nutshell, signing up for CHOICE Transformer turns you into the most proactively disloyal customer possible. This is fantastic for those who a) want to know their getting the best deal possible, and b) want to stick it to retailers by not paying any particular company a cent more than they need to. Copy from CHOICE’s description of how the Transformer program works. When making its decision, the Transformer algorithm takes into account not only the usage & connection fees that are the staple of any electricity bill, but also the various types of discounts, solar feed-in tariff rates, GreenPower & exit fees and crunches the numbers based on customers’ historic energy bills. This cuts through all the fog that can ordinarily make the retail electricity market prohibitively confusing. Furthermore, the fact that Transformer makes does the switching for you increases the likelihood that they will actually switch. It goes without saying that most households have bigger concerns than constantly checking to make sure that they’re getting the best deal on their electricity (unless they have a particular vendetta against the electricity industry). By signing up for Transformer, you entrust CHOICE to make the right decisions for you at every turn. Given the strong reputation that CHOICE has as a not-for-profit consumer advocate – and the fact that the program is the brainchild (or at least the output) of reputed energy economist Bruce Mountain – trust should come fairly easily for consumers. This goes double for people who are already fans of (or subscribers to) CHOICE’s magazine and other campaigns. Confidence that CHOICE is doing the right thing is further bolstered by the fact that a) they compare all retail electricity plans on the market, and b) they don’t take commission from retailers as they switch you (and indeed, retailers would not want to pay commission for customers that could be switched away from them next month – or next week). Other comparison sites may only offer comparisons of retailers who they’ve partnered with (and get commission from), which means it’s less certain that the deal you’re switched onto is necessarily the best possible one on the market for the duration of the period that you’re switched. How popular will Transformer be? And is it right for you? Judging by the media coverage and advertising that we’ve seen, it’s clear that CHOICE are pushing the Transformer program to raise awareness of it. That being said, it’s tough to say whether CHOICE Transformer will see significant uptake, given the annual fee. With most of the energy savings presumably being delivered at the first switch, for many households it may make sense to simply set a calendar reminder to use a free comparison site to look at the market once or twice a year – which is how often most companies change their rates anyhow. For those who are CHOICE fans and followers, however, Transformer may prove very attractive. It could also look pretty good for households with above-average electricity bills (e.g. over $1,000 per quarter), as the more electricity you use, the more you can potentially save by switching. And all of this begs the question that you may in fact be perfectly happy with your current retailer, even if you know you’re not getting the lowest possible rates. As we’ve mentioned before, choosing a retailer can be about more than just finding the plan with the lowest electricity rates and highest feed-in tariff rates (if you have solar) – and there are a number out there who promise more than just cheap electricity. Two comparison sites that we regularly recommend to our customers are the government-run EnergyMadeEasy.gov.au and the privately operated WattEver.com.au (who – full disclosure – we have a business relationship with). Both sites are free to use, include all electricity plan offers available on the market, and allow you to sort and filter plans by different criteria. While neither of them will do all the thinking – or the switching – on your behalf, both are fully worth checking on a regular basis. But you should still make sure you’re getting the best rates! Provided that you do it yourself, switching electricity plans is a simple thing that you can do to save money on your electricity bills – and all it costs you is your time. Solar, meanwhile, promises significantly larger savings (not to mention cleaner energy produced on your roof), but it does cost money. So what’s a household concerned about energy bills to do? Firstly, you should make sure you’re on a decent (if not the absolute best) electricity plan via the sites mentioned above. Secondly, you should actively consider solar if you don’t already have panels on your roof. Solar is relatively affordable these days, and payback periods are easily under 5-6 years in most parts of Australia. Previous post: NSW solar feed-in tariff rates to drop from 1 July 2018: What does it all mean?